Hot on the heels of its innovative Feeding Your Performance philosophy launch, International Convention Centre Sydney (ICC Sydney) is set to tantalise the tastebuds of business travellers, events experts and Sydneysiders with a new gourmet edition of its bespoke magazine, Sydney Views. 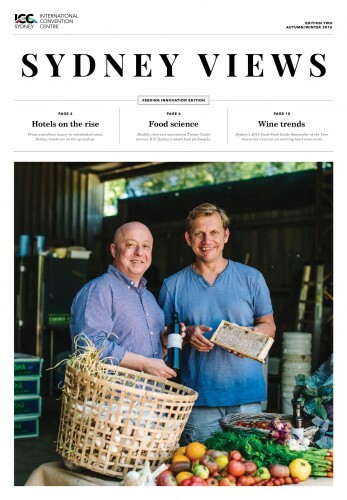 Titled Feeding Innovation, the second issue takes readers behind the scenes at ICC Sydney to reveal the team, producers and principles guiding the world class cuisine at the new convention, exhibition and entertainment precinct. This includes the industry-leading Feeding Your Performance culinary approach, which will see renowned executive chef, Tony Panetta, using fresh, seasonal, heritage produce with exceptional flavour to craft menus designed to fuel both body and mind. Readers can also explore Sydney’s hottest Autumn/Winter events, top food, coffee and wine experiences, the city’s most exciting recently opened, under development and on the horizon hotels, and hear from local experts such as James Hird, 2015 Good Food Sommelier of the Year, chef and nutritionist, Teresa Cutter, Dr Joanna McMillan, Destination NSW CEO, Sandra Chipchase, NSW Premier, Mike Baird, and Sydney Lord Mayor, Clover Moore. Geoff Donaghy, CEO of ICC Sydney, said the launch of the new edition alongside ICC Sydney’s food philosophy marks another great milestone in the lead up to the venue’s December opening. “Sydney Views has been extremely well received and this new issue takes locals and visitors alike on a whirlwind journey into the beating heart of our city and state, and the world class culinary expertise and experiences we have to offer. Launched by ICC Sydney at the recent Asia-Pacific Incentives and Meetings Expo (AIME), Sydney Views – Feeding Innovation is available in both print and online. Copies will be distributed directly to ICC Sydney’s extensive national and international client base, at key industry events including the upcoming IMEX showcase in Frankfurt, in local Sydney cafes and offices, and via partners such as Business Events Sydney, Destination NSW and Tourism Australia.